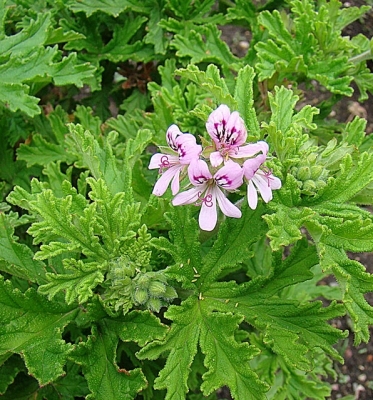 Apple geranium is an evergreen perennial plant with a woody rootstock, growing about 20cm tall. S. Africa to tropical Africa. Aromatherapy - A guide for home use. An excellent little pocket guide. Very concise. ]. The growing plant will repel flies, especially if the leaves are touched occasionally to release their scent. ]. Prick out the seedlings into individual pots when they are large enough to handle and grow them on in the greenhouse for at least their first winter. If trying them outdoors, plant them out in early summer and consider giving them extra protection during the winter. Cuttings succeed at almost any time in the growing season but early summer is the best time in order for the new plant to become established before winter.